A solo sailor who sparked a search when he was not heard from for six days has sent a radio message to say he is safe, well, and on his way to Cornwall. 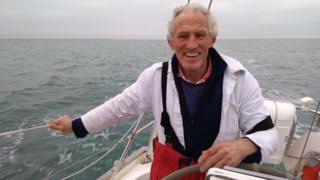 Robin Davie, 67, left port in France on his yacht "C'est la Vie" on Saturday for the 300-mile journey to Falmouth. His brother reported him as overdue on Wednesday morning when there had been no contact. But on Friday the coastguard said Mr Davie radioed to say he was 25 miles south-west of the Isles of Scilly. The coastguard said: "The skipper of the yacht 'C'est la Vie' has just reported that he has heard the broadcast action being made by HM Coastguard and that he is safe and well." Mr Davie has sailed solo around the world three times and is entered in the 2022 Golden Globe race. He left the port of Les Sables d'Olonne, in the Vendée region, at about 10:00 local time on Saturday and told his brother Rick Davie to let people know if he had not arrived in Falmouth by Tuesday. HM Coastguard confirmed it had "received a concern for welfare" report on Wednesday. Mr Davie is now expected back in Falmouth on Saturday.